After smashing multiple records yesterday with her round of 10-under par 62, she didn’t slow down this afternoon, signing for a round of four-under 68 to close out a clinical victory on her first visit to New Zealand. “It feels amazing, today was a great day and this whole week has been incredible. Words can’t explain how happy I am with this week, so it will be a memorable one,” beamed Kim. 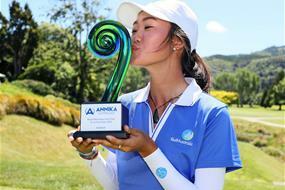 To have an 18th birthday, a personal best and an ANNIKA Invitational best all in the one week, “great” is an understatement for the Sydney based golfer who has a promising future ahead. Round one leader, Yuka Saso of the Philippines was unable to fire today but will be joining the third placed Doey Choi at the ANNIKA Invitational USA, presented by Rolex in January at the World Golf Village. Saso shone all week with her amazing ball striking and will be one to watch for the future. Wellington’s very own Darae Chung made a run for the top three which could have earnt her a trip to America, but she was unable to clinch one of the valuable three places to compete at Annika’s main event. When Choi nailed her birdie putt on the final hole, this took her out of a tie for third with four other golfers. Chung was the leading Kiwi on her own before Auckland's Carmen Lim holed out for eagle on the 17th hole to finish in style and sign for a round of five-under par. While a New Zealander was unable to make a run for the title, the inaugural ANNIKA Invitational Australasia was a huge success and exposed a lot of upcoming talent to some of the best in the business including the world’s greatest in Annika herself who continues to grow the game around the world.